The Inglenook Art Deco style 3 lamp Tiffany pendant ceiling light, featuring a pyramid shade with stepped border and classic geometric design, handmade using high quality art glass. Brought to you by Elstead Lighting and designed by Quoizel. A splendid medium sized three light Art Deco style ceiling pendant, with a detailed square ceiling mount and central chain suspension finished in valiant bronze. The wonderful Tiffany shade contains 248 separate pieces of high quality art glass and features a typical geometric design, with shades of amber, cream and earthy tones, highlighted with rippled glass panels in shades of amber, red and blue that will sparkle like jewels when illuminated. The stepped border adds an extra visual dimension and finishes the shade off perfectly. Fitted with a pull chain on/off switch that hangs beneath the shade. Supplied with 150cm of chain for maximum flexibility. Height adjustable by removing chain links at the time of installation, minimum height 42cm, maximum drop 188cm. 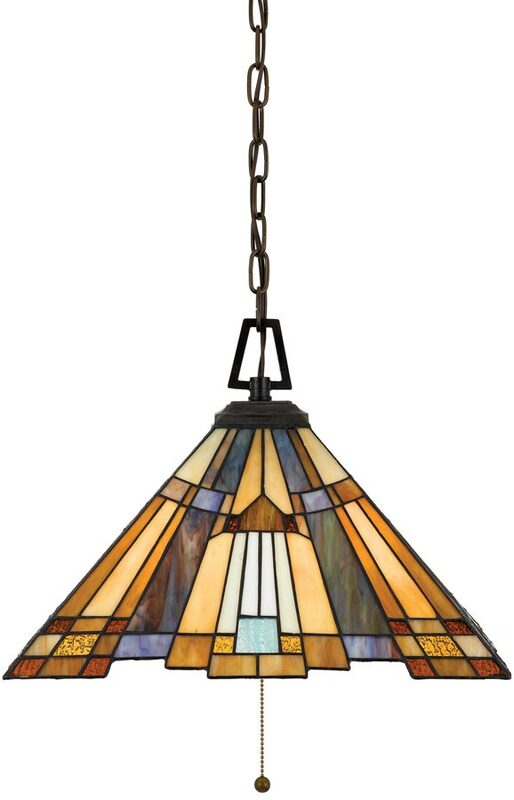 This is a hand-crafted Tiffany ceiling pendant lamp, soldered using traditional techniques that have been used for centuries. The shade colours may differ slightly from the image shown as each piece of glass is hand-made and may differ slightly in colour or shade. This should not be seen as a fault, rather something that makes each Tiffany shade unique.